OTT Content delivery for broadcasters – leverage new technologies to deliver TV direct to your viewers and open additional channels serving OTT revenue lines. 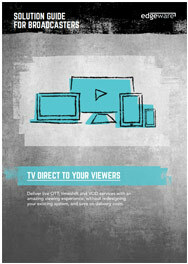 Download the free solution guide to find out how to deliver live OTT, timeshift and VOD services with an amazing viewing experience, without redesigning your existing system, and while saving on delivery costs. Thank you for your interest in our products. We have emailed the Solution Guide to you, but you can also download it directly using the button below.